Recently, the RSGB were on the lookout for a new trophy. Given this Club's keen involvement in all types of contesting - and in particular those administered by the RSGB (IOTA, 80m Club Champs, NFD, Low-Power FD, etc.) we decided it was time to give something back. 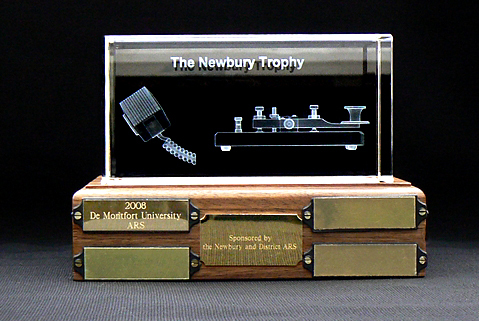 So "The Newbury Trophy" was commissioned. It is made of glass with a 3-D image of a microphone and Morse key embedded within. The glass block measures about 6"x3"x3" and stands on a rosewood base. 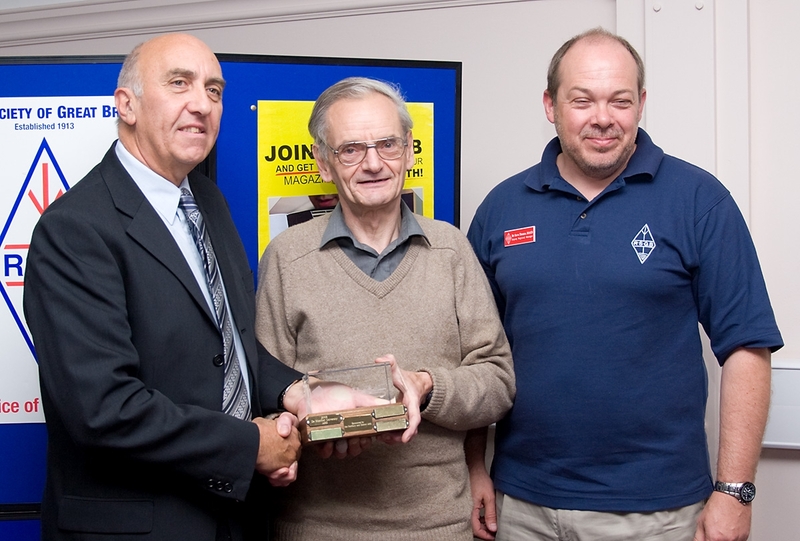 My club, the De Montfort University Amateur Radio Society, are the first recipients of the trophy and were delighted to be presented with such a novel item. I don't know if things were deliberately shrouded in secrecy but first there was a letter from the RSGB mentioning an "award". Then Graham, G4FNL (a member of the Contest Committee) told me there was no trophy for the 80m Sprint series. Finally, the day before the presentations, Done Field, Chairman of the Contest Committee told me he had located something in a cupboard at Abbey Court! You can therefore imagine how surprised we were to be presented with "your" trophy. It is certainly something well worth trying to win again and I hope you will be able to tell your members just how much we at DMUARS appreciate your kind donation.